This is the third Headgear strap I've ordered from this vendor. They each have lasted a couple of years before needing replaced due to disintegration of straps at back of head. They have always worked very well and are extremely comfortable. My only problem is that I have a larger head and this time forgot to take that into account when I ordered. Should have remembered to purchase the larger size. It is good quality the design on all these I have gotten not just yours is the headband stretches and at the end rubs the top of your ear raw. It sure would be nice if they could fix this or add padding. JUST WHAT I NEEDED & ORDERED.......A LITTLE PRICEY BUT GOOD !!!!!!! Fits great! Thanks for noticing I had ordered the incorrect item initially! Bought as a back up strap, purchase and shipment was quick, definetly will buy again from here and Highly recommended. It was a little different than my old one but it worked out just fine and was very comfortable. Called around a few places and found my headgear had been discontinued. But,when I contacted your company, you had what I needed in stock. Now I'm sleeping sound again. Thank you Best Cpap Price. Item was exactly as advertised. Delivered in a very timely manner. I am VERY PLEASED! I've used the RedMed Adjustable Headgear for several years now and have ordered replacements as needed. Every piece of headgear have held up well and are easy to fit and use. 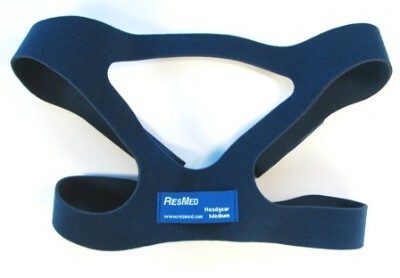 Q: AirFit™ P10 Nasal Pillow CPAP Mask Kit by ResMed does this head gear fit this? A: No, the part numbers for the P10 headgear are 62935 and 62936. They are the only ones that will work with the P10. A: The 16117 is the medium/standard size. The used to say medium but ResMed changed it to standard at some point. Part number 16118 is the small size and 16119 is the large.